One of my stranger Sandy experiences occurred when a friend showed up at my front door with a ball python. 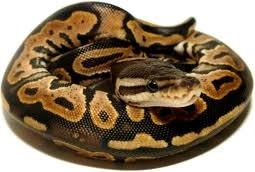 My wonderful friends, Lev and Nicole lost power in the storm, and their son’s pet python, Oscar, needed to be kept at eighty-degrees Farenheit. Did I mention, I hate snakes and never even look at Oscar when I am over their house? So, snug and cozy with his heat lamp plugged in, Oscar settled into his new digs, and I tried to keep an open mind. Fortunately, Oscar did not seem to be too interested in me, and during the day he mostly stayed coiled up in a rock-like structure. He did slither out the first day when I was checking my roast beef in the oven, causing me to inquire, “Can snakes smell?” A quick Google search yielded the answer, yes, they smell with their tongue. Hmm…interesting. Later, I was playing the piano, quite badly, I might add, and Oscar came all the way out of his rock and slithered to the opposite end of the tank and up the side. Next question, “Can snakes hear?” Thanks to the internet, I learned that snakes feel vibrations, and can even sense the patter of little rodent feet in nearby grasses. Hmm…interesting. I was learning a lot from Oscar. The most important thing that I learned, however, is that if you ever want to test a friendship and find out if someone really loves you, bring them a rodent-eating python. If they accept it, you’re good!